North and South Korea have for the first time jointly proposed registering cultural practices with the United Nations, amid an ongoing atmosphere of reconciliation between the once hostile neighbours. 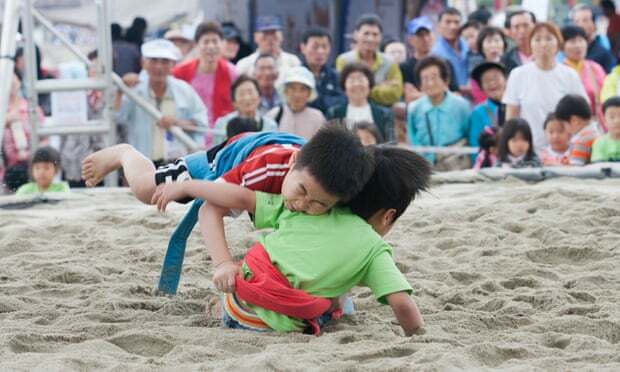 The two countries have combined their bids to list ssireum, a type of traditional Korean wrestling, as intangible cultural heritage with Unesco, the United Nations cultural organisation. The official name will be listed at “Traditional Korean Wrestling (Ssirum/Ssireum)”, with the North Korean transcription appearing first. Audrey Azoulay, Unesco’s director general, worked to convince the two Koreas to combine their applications and described the move as an “unprecedented result”. “It reminds us the central role played by cultural heritage in tightening the links, as an emotional hyphen between peoples,” she said. While it is common for countries to jointly submit bids for the listsuch as the “mediterranean diet” or falconrythe two Koreas have typically been in competition for adding new items. Traditions widely shared between the two neighbours, including kimchi and the folk song “Arirang”, have so far been listed separately, with South Korea’s entry coming first. A Unesco committee will vote on the merged application during a meeting in Mauritius on Monday. But since North Korean leader began a dramatic rapprochement at the beginning of the year, tensions have cooled on the peninsula, leading to sport and cultural exchanges and the removal of guard posts along the heavily fortified demilitarised zone. The two sides also agreed to restart a project to compile a joint dictionary to reconcile differences in the language that have cropped up from more than 70 years of division. The entire Korean peninsula was unified for over a millennium until 1945, when in the wake of the second world war, the Soviet Union occupied the North and the United States occupied the South. The division along the 38 parallel has long been seen as an artificial boundary by people on both sides of the border, who share cultural traditions, history and cuisine. Ssireum was widely popular in South Korea as recently as the 1990s, but has virtually disappeared from public view with the rise of baseball and e-sports. 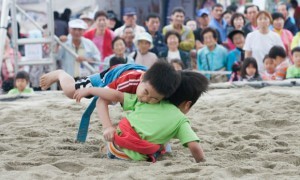 Competitors face off in a ring covered in sandwhere men go toplessboth wearing a cloth tied around their waist and left thigh. The first to touch the ground above the knee loses. Officials from North and South Korea explained the sport using the exact same terms, according to a UN diplomat who visited both ahead of the listing, adding that he “felt the emotion in their voice in talking about the sport”. The joint effort is the latest sign of the two Koreas working to improve ties, but they remain hamstrung by international sanctions on North Korea over its missile and nuclear weapons programmes. The US has said it will maintain sanctions until Pyongyang completely relinquishes its nuclear arsenal, which could limit future engagement.